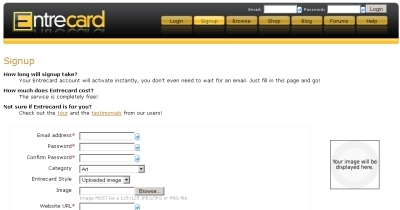 In my post How to use widgets for increasing traffic I described 4 basic social networking sites. BlogRush, BlogCatalog, MyBlogLog and BUMPzee. Main source of traffic from these sites was from Last visitors widget, except of BlogRush with Other blog posts widget. 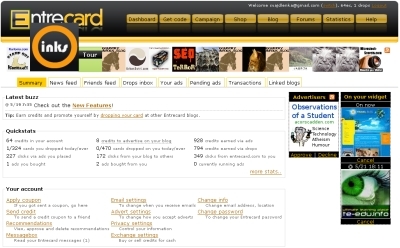 In this post I want to write about next social networking site Entrecard. Earn credits from adding link on my site to another site. Earn credits from dropping other widget cards. Earned credits I can use to buy ads for my site. It is very simple view on the system. 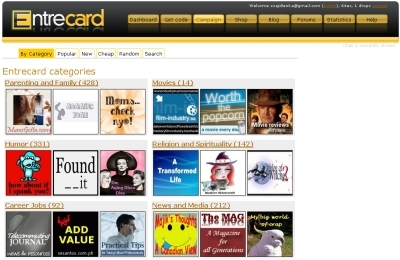 Entrecard has much more possibilities how to earn or spend credits. More info how to work with it you can find bellow or in Entrecard Official E-Book . After pressing Sign up now! on Entrecard main page you have to fill registration form. Before filling data prepare your card, 125*125 image, that represents your blog. Make it as attractive, as it is possible, because it must attract visitors to click on it. After filling data and pressing button Signup it is time to add a widget on your blog. 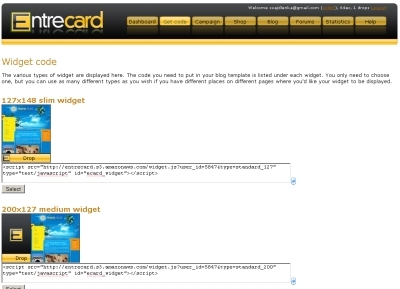 To add the widget on your blog you need code, that you can add on your blog. To do it, click on link Get code in header of page. Then choose type of widget and copy the code to clipboard. To add it on your blog, go to Blogger pages and add code to template just as you did it while adding AdSense code. After successful adding widget on your blog it is time to earn some credits. You can do it simply by dropping card on another blogs, or approving ads on your site. Ad will be shown in your widget for 1 day. Go to Dashboard page, where you will find all necessary links. When you want to advertise your blog to spend your credits, go to Campaign page. There you can choose blogs where your ad can be shown. There is important how much credits you can spend. Each blog has own price for advertising. This price is generated from blog popularity. You can advertise on more blogs, but your add will be shown only after approving by owner of site. Now I want to describe main advantages and disadvantages of Entrecard. Not very well targeted traffic. A lot of visitors visit your page only for dropping card. If you try Entrecard is on your decision. And it is also your decision how much time do you spend by dropping cards. My opinion is, Entrecard is very good source of traffic, especially for new blogs. Communities of people who share interests and activities or who are interested in exploring the interests and activities of others. is an element of a graphical user interface (GUI) that displays an information arrangement changeable by the user, such as a window or a text box. This entry was posted in Make Money Online and tagged money, social bookmarking, widget. Bookmark the permalink. Darn, I just closed my window and have to re-commnet. I agree with your article 100%. Most EC traffic is not worth anything except lowering you alexa rank. Because of this I have started using EC on 2 sites where I want to lower the Alexa, but am not too concernet with the traffic being no good. I have a site of my own that uses EC, but I never drop for that site. If I get traffic, cool. I log into the account when I get an email saying I have an advert to approve. I have a week waiting list, so that is ok.
to make dropping faster for my EC site I have made some batch files (free for everyone to use at: http://cheapkeywords.info/Entrecard.html). Click on a buton and 15 tabs open in Firefox. Wait until the visible window opens that start clicking and closing windows. These batch files work best in Opera. Speed up firefox by going to View and closing your toolbars. This helps some sites get extra traffic too. I visit your site almost every day to drop. Usually from this account, sometimes from others. If you know anyone that wants added to my batch files just let me know and I will add them. This is very exciting topic,it contains lot's of info,anyone who wants to be the part of bpo process absolutely he i'll get lot's of knowledge in it. Yes indian bpo is also very great.they do really very good work & mostly indian firms are on the list top 100 bpo companies.